A very attractive home located on the top ridge of Sandy Lane Estate, Galina overlooks the golf course which adjoins, and has a lovely view across to the Caribbean Sea. 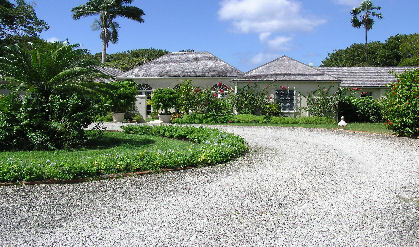 The grounds are most attractively landscaped and add to the charm of the property. There are three double bedrooms, one just off the swimming pool terrace, and each bedroom has its own bathroom ensuite. The master bedroom suite has its own sitting room. There are also two small single bedrooms that share a bathroom. The large living room is in the centre of the house and opens onto the large covered terrace off the pool. On the south side of the living room there is the dinning room, butler�s pantry, kitchen etc. LOCATION: About 1 1/4 miles to Sandy Lane Property Owner�s Beach Facility, just under two miles to Holetown, 7 miles to Bridgetown, and 16 miles to the airport.